Volunteers from Grandma Cares and Volunteer Positive joined the English Camp held on Lamphun at the Chalermprakiat School for Girls. Grandma Cares Partnership Program (GCPP) English camp, that was held this past Friday (the 20th) at Chalermprakiat School for Girls in Pa Sang, Lamphun. GCPP collaborated with Rotary Club of Chiang Mai ThinThaiNgam and Volunteer Positive International Service for People Affected by HIV (VP). Our facilitators came from Canada, Malaysia, America, and Botswana to teach 195 high school girls basic English. After a warm welcome from the school director, Mr Kasem Treeintong, Rotary Club members handed out English/Thai dictionaries to all the girls to help them continue learning English. 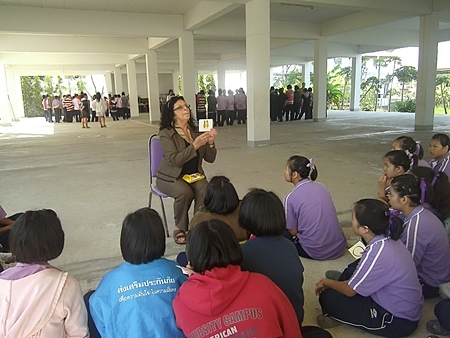 Volunteer Positive donated the 10,500 Baht for the girls, teachers, and facilitators' snacks and drinks. GCPP donated 3,000 Baht to Chalermprakiat school's general fund as well as providing materials for the camp. At the end of the half day English camp, several of the girls stood up and shared their delight in being part of this camp and what they had learned. The camp was held by GCPP and the Rotary Club Chiang Mai ThinThaiNgam. 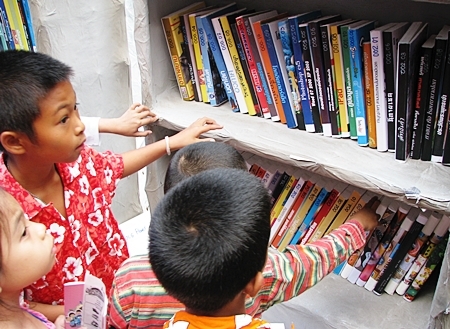 Kad Suan Kaew had not only a lot of fun games but books that the kids eagerly grabbed. 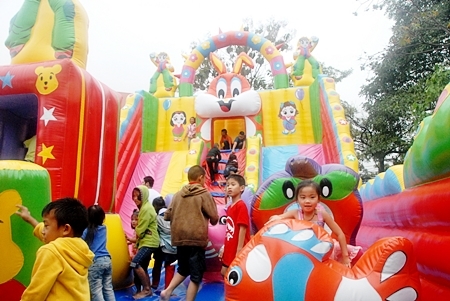 Children’s Day falls on the second Saturday of January every year and sees children enjoying fun, games and activities around the city. National Children’s Day was enacted originally held on first Monday of October with the very first day in1955. In 1963 the government changed the day to the second Saturday of January and it has been held annually on that day ever since. The day is held to show appreciation for children and to raise children’s awareness of their importance to the future of Thailand. 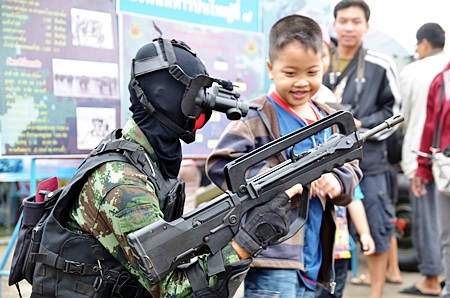 The Chiang Mai Municipality set up activities at the Municipal Stadium that saw many kids take part, despite the cool weather. 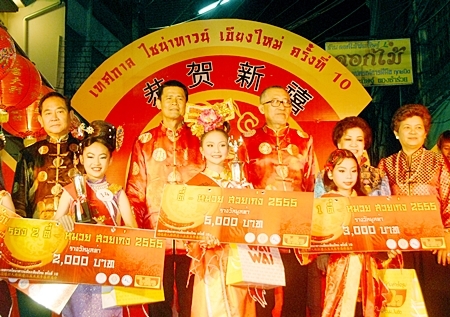 (Photo courtesy of Chiang Mai Municipality). Wing41 was a popular destination for Children’s Day (Photo by Martin Vanderklooster). 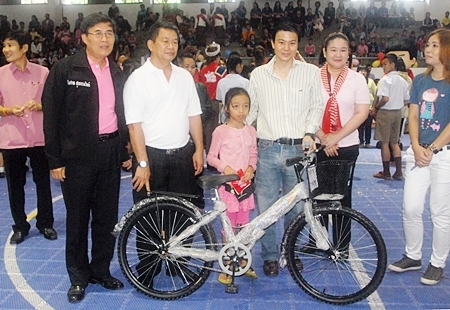 Chiang Mai Mayor Tussanai Buranupakorn gave one lucky child a new bicycle on Children’s Day. The Chiang Mai Zoo Aquarium had fun and games for kids that visited the Zoo for free. (Photo courtesy of Chiang Mai Zoo Aquarium). 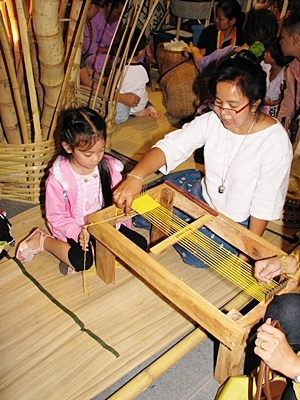 Panyaden School offered educational activities for children at Central Airport Plaza. 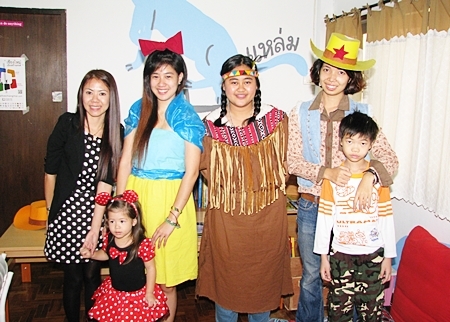 Meedee Depot on Sirimangkalajarn Soi 5 hosted reading and fun for kids on Children’s Day. 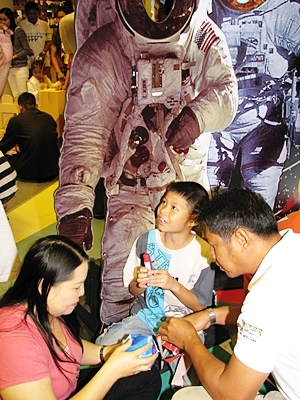 Kids learned about astronomy and the stars from the National Astronomical Research Institute of Thailand at Central Airport Plaza. The Chiang Mai Toy Ride is looking for individual and corporate sponsors for their upcoming February 19 Toy Ride. Offering much more than just fluffy toys collected during the main ride, their goal is to help kids that are under the radar. This runs from building toilets, renovating dorms, providing school supplies, and even shoes, for the first time in some kids lives. Chiang Mai Mayor Tussanai Buranupakorn congratulated local students who took part in the regional qualifiers in Tak from November 14-25. More than 21 medals were awarded in 9 different sports. 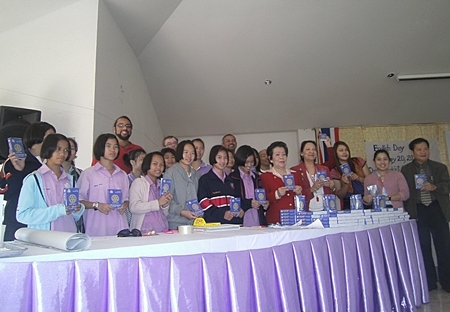 Here the Mayor is seen with the athletes from Chiang Mai Municipal schools who attended the event, including those wearing their winning medals. 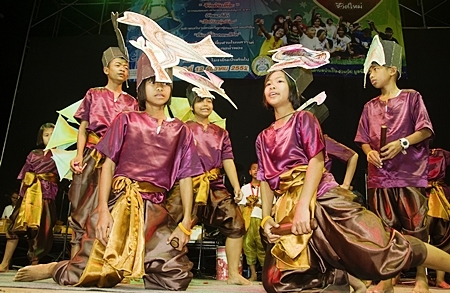 Children from Baan Gerda in a scene from the opera 'A Boy and a Tiger', performed at Khon Kaen, Thailand, December 2009 (Photo by Dave Stamboulis). The film “Living with the Tiger”, directed by Mike Thomas, is the story of children from Baan Gerda, a small village in rural Thailand that cares for HIV and AIDs affected children, many in poor health, orphaned by the death of AIDs affected parents and cast out by their families and communities. This moving documentary film depicts the efforts of Bruce Gaston to empower these children with music. He first started teaching the children music in 2007 and worked with them to write and perform an opera. As the project grew, children from surrounding schools and communities were invited to join. The movie centers on several boys; Oy and Bia, both AIDs orphans whose extended families were unwilling or unable to care for them. Bia becomes one of the central characters in the opera and speaks openly about the feelings of loss and abandonment and being ostracized by his community. 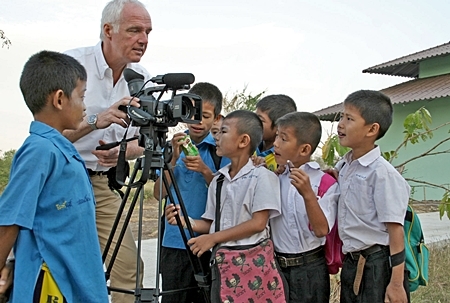 This moving film will be shown to the public at Lanna International School on Tuesday, January 10, 2012 at 5:30pm. While tickets are free, reservations are essential. [email protected]. Bla, 16. 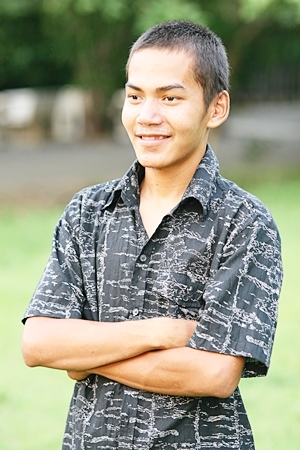 The main character in the film 'Living with the Tiger' (Photo by Mike Thomas).